There has been much written (with more every day!) about where to enter a trade. But often, exiting a trade is even more important in terms of impact to your P&L – and for many traders, much more difficult. So we have added some calculations to help analyze your trade exits – helping you answer the questions like did you exit at the right place, and how much did you leave on the table? Before we get too far into this, let me mention that for some trades, this is irrelevant. If you enter a momentum trade, it ticks up a few points, and you sell when the momentum dries up, you made the right decision according to your plan. If the stock consolidates for an hour, then pops up another 6 points, it doesn’t matter – you still made the right decision. 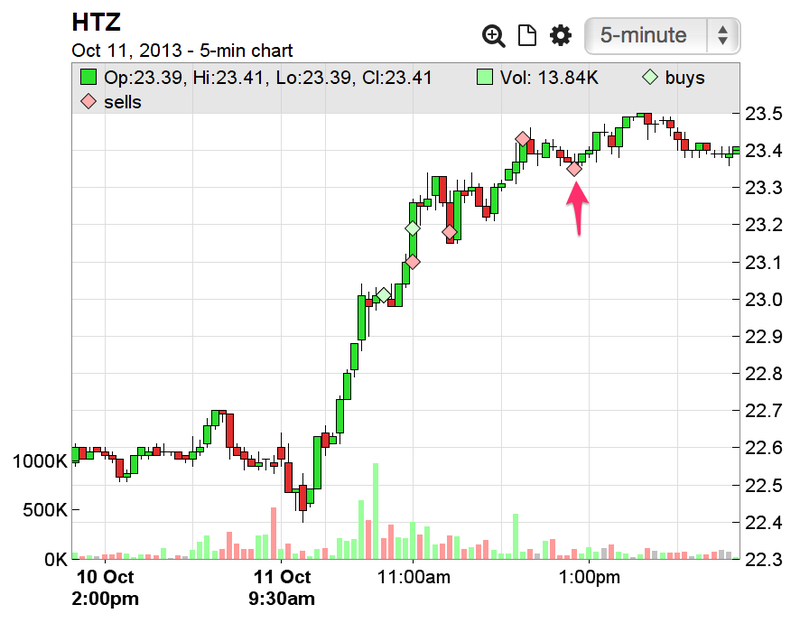 On the other hand, if your plan was to make a trend trade, then perhaps you should have captured more of the move. Starting today, Tradervue will calculate the “best exit” P&L for each of your eligible trades. 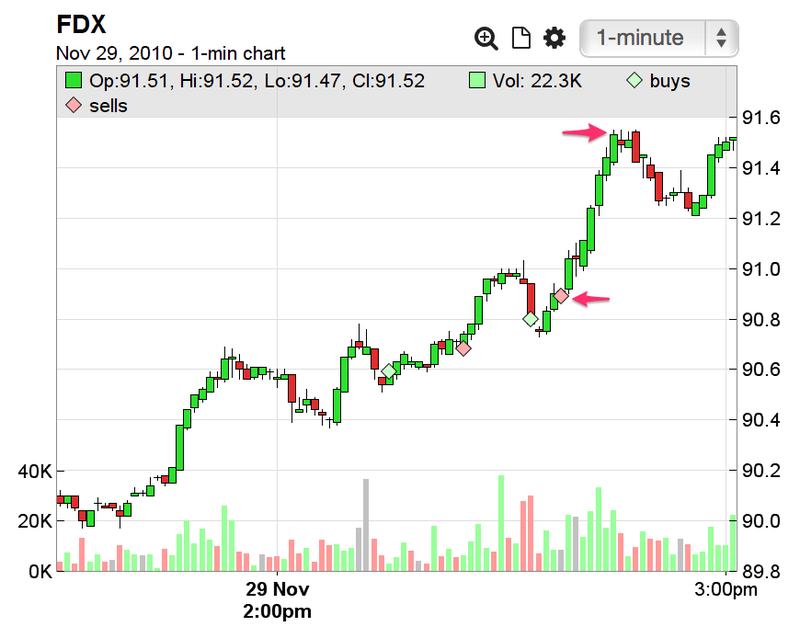 That best exit is determined by “floating” the last exit executions up to their highest point (or lowest, in the case of a short); this exit point may be before or after your actual exit. By looking at this best exit value in comparison to your actual P&L in the trade, you can quickly see how efficient you were in terms of extracting P&L. Looking at that last exit, we see that if we had delayed it a few minutes, we could have extracted much more from this trade. For this trade, only the last execution will be moved around to find the best exit P&L. How much drawdown did you take on in the real trade (i.e. the Position MAE of the trade). We’re not going to assume you’re willing to take on more risk than this. 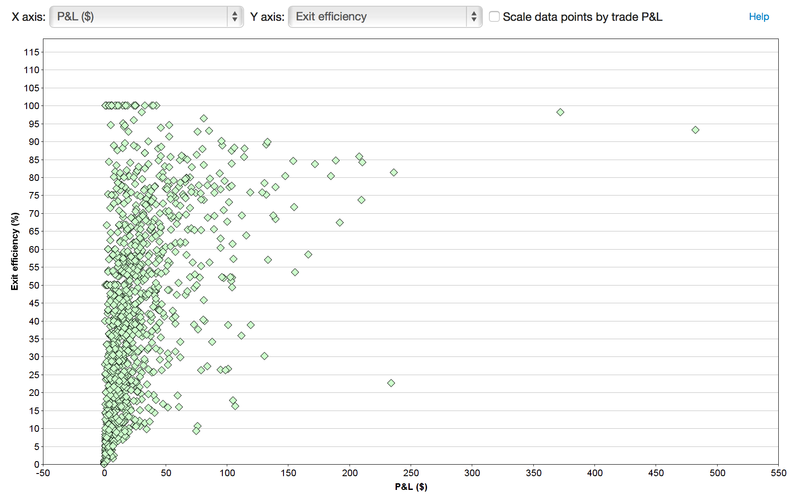 The larger of those two values will be used as the max drawdown value when calculating where the best exit would be. 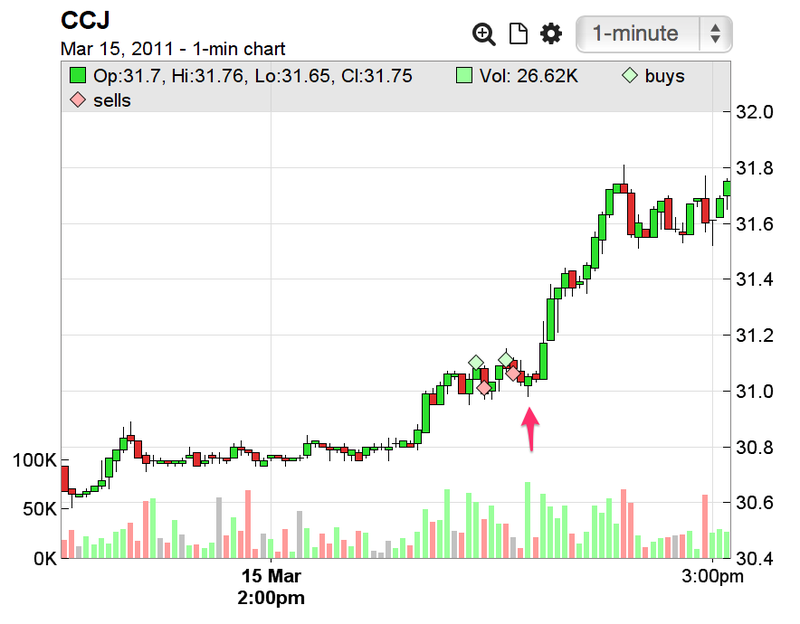 We see that the last sale could have been much better – about 0.75 higher. However, immediately after that last sale, we see the price dropped further. We were already at a loss at this point, and if we held that last part of the position, we’d be at an even greater loss than you took in the actual trade – which, unless a larger initial risk was specified, is not acceptable. Therefore, the best exit for that execution would be the top of the exit bar, only about 0.06 higher than the actual exit. However, suppose the plotted executions were 100 shares each, and we specified an initial risk value of $50. In that case, the drawdown after the last exit would not exceed the allowable risk, and it would be moved to the peak at about 31.80 for purposes of best exit calculations. Basically, it represents what % of the theoretical P&L did you extract from the trade. We see there were some entries and exits working into this trade, and then the final cover at about 74. But we can also see that without accepting any additional risk, the best exit would have been at about 67. 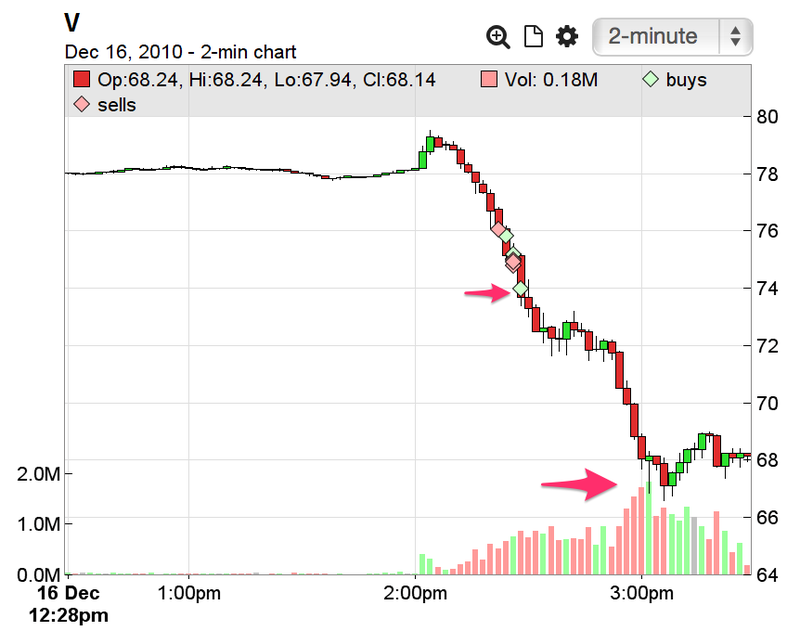 For this trade, that makes our exit efficiency at about 9.2% – clearly a trade we can learn a lot from, and study further to help us understand why we exited so early. If you hover over the words “Best Exit P&L”, the time of the best exit will be shown. Exit analysis is automatically done for all closed stock, futures, and forex trades, under 7 days in duration, done during regular market hours (for stocks). The time period considered runs out until the end of the trading day for each trade (which may be the next calendar day for futures). There are some further specifics available on the Exit Analysis help page. Exit analysis is available today for all users on the gold subscription plan! UPDATE 04/13/2015: Exit analysis is now enabled for forex trades. This entry was posted in Announcements and tagged analysis, exit, exit analysis by gregr. Bookmark the permalink.